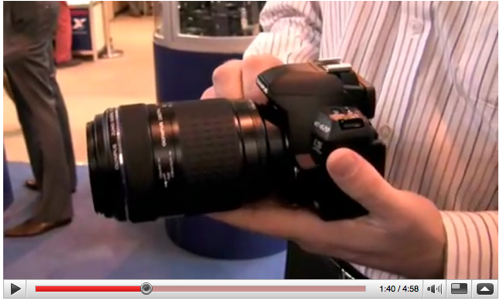 Last update (Jun 17, 2009): Olympus E-620 digital SLR Review at TrustedReviews. This post is a compilation of Olympus Evolt E620 professional and user reviews, owner opinions, reports and experiences, tests, conclusions, ratings and feedback. Hopefully, you’ll be able to conclude whether the E-620 image quality, and the camera itself as a whole, meets your standards. Picture quality isn’t necessarily an improvement over the E-520, but there are differences. For one there’s more detail at lower ISOs but the incidence of noise is increased slightly at higher ISOs. That said, Olympus has both altered and improved noise reduction algorithms, as the once distracting coloured speckles are all but eliminated (with the exception of the deepest shadows) from out-of-camera JPEGs up to ISO1600. In the opinion of the author, the Olympus E-620 is “the best consumer DSLR made to date”. In all the E-620 packs nearly everything that I would want to see in a camera. If you don’t want a large SLR camera such as the E-3 or E-30, this camera should be at the top of your list no matter what system you shoot. If you are stepping up from a more inexpensive camera this would be a good choice. Or if you are looking for your first DSLR it too would be a good camera. However, if you are geared more towards a E-3 / E-30 professional level camera it will not compare, unless you want a smaller carry-around camera. J. Andrzej Wrotniak of Wrotniak.net has written what I think is the best run-down on the E620’s specifications and features. The first, called AF Sensor, uses the more traditional AF method: dropping the mirror to use the traditional autofocus sensors. The unfortunate side-effect of this is that you lose Live View while the camera tries to focus, which often makes the process slow. The next mode, however, is a blend of the contrast-detect mode most people are used to on their old digital cameras and the traditional SLR AF method mentioned above. The E-620 uses contrast detect to get the focus inline while you watch, then when you press the shutter, it drops the mirror, focuses with the AF sensors, and takes the shot. Provided you or your subject doesn’t move much, this is a pretty good compromise that gives you the interface you’re used to from point-and-shoot digital cameras, combined with the accuracy inherent in SLRs. If you’d rather get shots faster, and don’t mind relying on contrast-detect autofocus alone, you can set the E-620 to Imager AF. In this mode, you can move the AF box around the screen or let the E-620 select from among 11 areas on the screen. DCRP has a pretty comprehensive, one-page preview of the E-620. You’ll find a couple of interesting tables comparing the dimensions and weight of the E-620 against the Canon EOS Digital Rebel XSi 450D, Nikon D60, Panasonic Lumix G1, Pentax K2000 and Sony Alpha A350. Another comparison table pits the E-620 vs E-420, E-520 and E-30 in terms of features and functionality. They were not able to assess image quality as they only had a pre-release unit to play around with, but they’ve put up some nice photos of the camera to give you a good idea of how it looks like. There’s a side-by-side photo of the E-620 vs E-520 comparing the physical dimensions of both cameras. Buttons on the rear of the camera are backlit. This is pure genius — at the time of writing, I can’t think of another digital SLR camera that has this simple but effective feature. The layout of the 7 AF points on the E620 is a huge improvement over the E520. 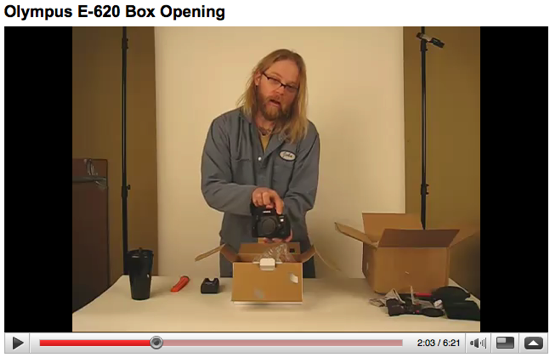 They’ve also posted an un-boxing video clip, where measurements comparing the E-620 to the E-520 are also shown. Click the thumbnail to view the footage on YouTube. I like how good the E-620 seems to fit in the hand, how compact an image-stabilized, 600mm FOV (field-of-view) DSLR package can be, and the tilt-and-swivel LCD. Click the thumbnail to view the video clip on YouTube in high quality mode. Mark also mentioned that the E-620 plus the Olympus 25mm f/2.8 Zuiko pancake lens should be small enough to fit in a coat pocket. Shooting with the Live View (LV) and Contrasty B&W filter turned on was also demonstrated. Autofocus in LV mode seemed quick enough. Availability in the UK will probably be around the beginning of May, 2009.